Are you in search of CDAC Pune Recruitment 2018-2019 Notification? Then you are at the right place. Aspirants who are willing to apply for the Centre for Development of Advanced Computing Pune Recruitment 2018-2019 can check out this entire article. All the aspirants of Pune, Maharashtra can refer this article to get the latest updates about this trending recruitment. The Centre for Development of Advanced Computing is conducting this exam to select the talented aspirants for various posts like Project Engineer, Project Officer, Project Associate, Project Support Staff. So, the candidates who are interested in particular fields can check the number of posts and eligibility criteria and then apply for the job according to your interest. Apparently, aspirants who are showing interest to apply can before the closing date 15th April 2018. In addition to this, you can also check cdac Pune recruitment 2018, cdac recruitment 2018-19, cdac recruitment 2018. CDAC Pune Recruitment 2018-2019 Notification is released by the Centre for Development of Advanced Computing(CDAC). And, the notification consists of 89 Vacant Posts. So, the contenders can check their eligibility criteria for each vacant post and apply for the desired vacancy. Also, the Centre for Development of Advanced Computing is accepting the eligible applications on or before the last date, ie., 15th April 2018. Moreover, candidates who are willing to apply can check the notification link that we are providing in the upcoming sections. Thes links redirect you to the official website. Also, while applying for the application aspirants have to check the eligibility criteria carefully, In case of, wrong entries the application form of the candidate will be rejected permanently. You can also check the details regarding jobs for cdac freshers in Pune, cdac project engineer salary, cdac recruitment process. Read our whole article for more details. As you check the above table, you can get the overview regarding the name of the company, the number of vacancies. Also, the name of the posts, starting and closing dates, mode of application is online. Aspirants have to apply for the CDAC Pune Recruitment 2018 through online mode. Hence, for the quick application, you can check the links that we are providing you at the bottom of the article. Along with these aspirants can also check the details regarding the Selection Process, Application Process, Post wise vacancies, Salary, Age Limit, Age Relaxation, Application Fee, etc. And, apart from these, we are also giving some simple steps in the next sections. And those will guide all the interested people, to apply before the closing date. The closing date of the application as mentioned above. The important thing everyone has to cross check when you are applying for any recruitment is the number of posts, eligibility criteria, and educational qualification. Therefore, here the education qualification for CDAC Pune Recruitment 2018-2019 is any graduation related to computer science, postgraduation, and B.E/B.Tech, MBA, MCA. Therefore, aspirants who meet the educational qualifications above can confidently apply for the suitable post. The age limit is also the important factor that every individual has to check. The maximum age limit for this current recruitment is 37 years to 50 years. And, this age limit varies from one post to another. Therefore, we suggest all the aspirants check the eligibility criteria before applying. The officials of Centre for Development of Advanced Computing(CDAC) also gave the age relaxation on the official notification. So, when you come to the Application fee it is 500/- for the General Categories. And, then there is no application fee for the backward categories like SC/ST/PWD. Also, the female candidates are exempted from the fee. So, we suggest the aspirants check the notification twice before applying for any job. Aspirants can pay the application fee through the Net Banking or Debit Card or Credit Card. The main thing every individual who is going to apply for the CDAC Pune Recruitment 2018-2019 Notification has to remember is o pay the application fee before the closing date of the application form. Then only your application form is accepted. In case of late payment, the aspirant’s a[pplication will be clearly rejected. Also, if you do not pay the application fee you application is not acceptable. As you want to know about the pay scale, you can check the below details which we are furnishing in the upcoming sections. Also, as it is the Central Govt Jobs the pay will be high when compared to other fields. 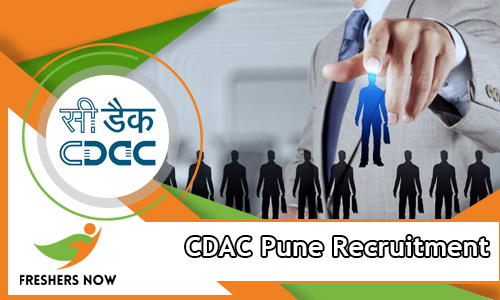 And, you can just click on the link to download the application form of CDAC Pune Recruitment 2018-2019 Notification. Aspirants who have done their qualification in B.E./B.Tech./M.Sc/MCA. Master of Pharmacy/ MBA in System & IT/ Graduate/Computer Science / IT / Post Graduate degree / Post Graduate in Science/ Engineering or Technology or its equivalent degree from the recognized college or university is eligible to apply for the CDAC Pune Recruitment 2018-2019 Notification. The maximum age limit based on post wise is given below. Aspirants whoever are belonging to reserved category (SC/ST/OBC)/Ex-servicemen/physically challenged would be eligible for relaxations according to the ‘Government of India’ norms. Also, Government employees will be eligible for relaxation in age by 5 years including other age relaxations. Project Engineer – 31,000 to 38,750/- based on the post qualification relevant experience. Go to the official site of the Centre for Development of Advanced Computing(CDAC) @ www.cdac.in. Therefore for more updates regarding CDAC Pune Recruitment 2018-2019 Notification & 89 Project Engineer, Project Officer & Other Vacancies keep browsing our website.